Our manufacturing plan includes revolutionary products based on rolling and welding metal plates. These can be semi-finished (shells, separate cones) or finished products (silos, kilns, cauldrons, rolling rings, machined parts etc). 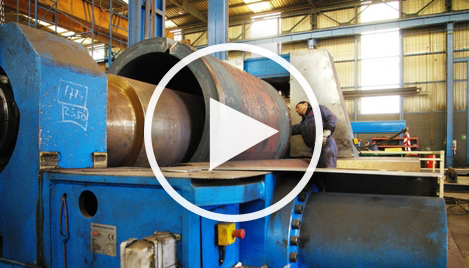 We specialize in rolling big thickness plates between 20 and 300 mm thickness, although depending on the volume of the job, we can work with thinner metal. We have 16 cranes that can lift up to 110 tonnes. We have 2 oxy-fuel cutting tables with a capacity for a thickness of 350 mm in carbon steel and 100 mm in stainless steel. Regarding the rolling, we cover all diameters from 400 to 7000 mm, and have 9 rolling machines with a capacity of up to 2200 tonnes. 95% of all welding is done using submerged arc welding, and we have four SAW welding machines. The smallest is capable of accepting diameters from 350 mm., and our procedures are in compliance with the ASME and EN regulations for various materials – SA-516 Gr70, SA 302 GrB, SA 387 Gr11 Cl2, 20 Mn Mo Ni 4-5, Aisi 316L, etc. We machine our own small parts and we work closely with our collaborators for the machined parts with diameters from 2000 to 7200 mm. Our kiln has a capacity of 80 m3 and 30 tonnes for the Stress Relief Treatment processing of our products .